Think about traditional SUV brands and Maserati certainly isn’t one. The Italian company is more famous for producing stunning sporty GT cars than utilitarian SUVs, but it’s 2017, and high-riding four-wheel drive machines are hot property. 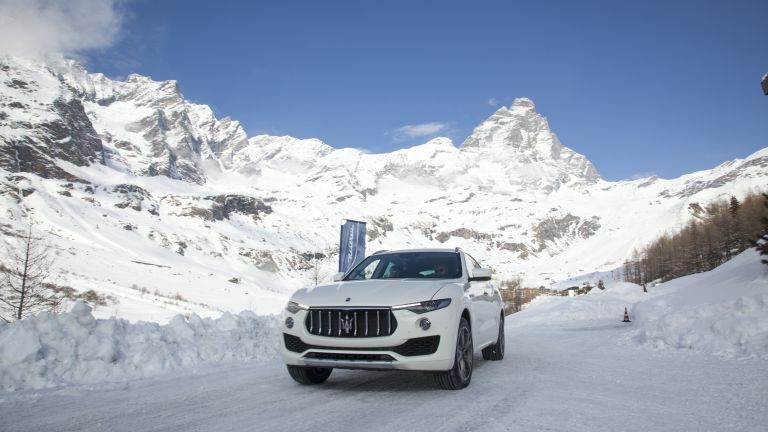 The Levante is Maserati’s first effort at a soft-roader, and T3 recently flew out to Courmayeur, an Alpine resort on the Italian side of the Alps, to test the sporty SUV in its natural environment. Thankfully, you’ll quickly forget about its looks once you climb inside. The interior is spot on, and did enough to win us over. It’s luxurious, designed with flair and precision, with lashings of rich leather throughout the cabin. The infotainment system isn’t the most advanced out there, but it’s intuitive to use. The Levante feels at home in the glamorous ski resort of Courmayeur. Despite being a sporty SUV it’s surprisingly practical, with plenty of space for ski gear. We set off from the centre of town towards an ice track, to see how the Levante can handle more challenging surfaces. Maserati only offers the Levante with a diesel engine here in the UK. The 3.0-litre V6 produces 275bhp, and powers the car from 0-62mph in 6.9sec. It’ll eat up motorway miles comfortably, and is surprisingly fun on the twisty back roads as well. Before we knew it, we’d arrived at the icy test track. This gave us a chance to test out the Q4 all-wheel drive system, which comes on all Levantes (Levantii?) as standard. It’s designed to deliver a typical rear-wheel drive experience (even in low grip conditions), but can instantly transfer traction to the front wheel when needed. In dry conditions Q4 will send 100-percent of power to the rear wheels, but when it looses traction on more challenging surfaces the torque is split evenly between front and rear. The sophisticated algorithm behind Q4 monitors a number of variables in real time, (including, wheel speed and grip, steering, yaw angle, power output, speed, and braking action) and processes the data to determine a grip profile for each wheel, all in 100 milliseconds. This allows it to adjust the vehicle setup instantly to offer a balance of safe yet exciting dynamics. When throwing the Levante around the frozen track we were able to test out various driving modes the Q4 system offers. ICE mode is the safest of the bunch, it’ll intervene as soon as it feels the car starting to slide and bring everything back under control. Hop over to Sport mode and the car will let you have a bit more fun, starting to get the rear end out around corners, but keeping it within controllable levels. We weren’t skilled (or brave) enough to turn the traction control systems off completely. Overall, we were very impressed how the Levante handled everything we threw at it. It's sporty, practical, luxurious, and can even handle some tricky off-road conditions. Maserati has succeed in offering an alternative to more staid Audis and BMWs. It may not technically be the best option out there, but it’s more stylish, desirable, and has more personality than its competitors.